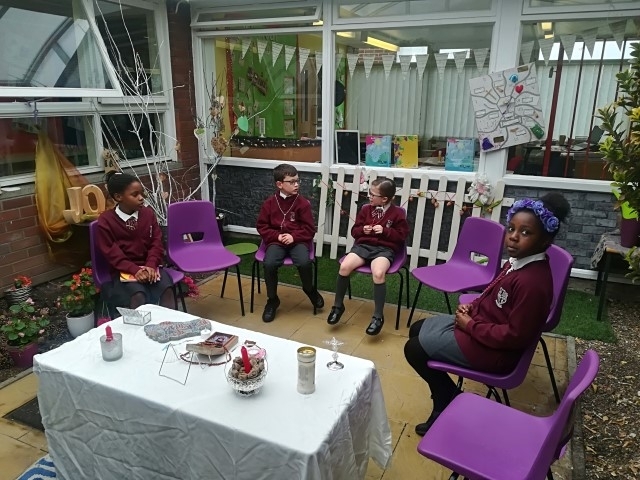 Our Gift Chaplains have been working very hard to reorganise our quad as a place for reflection. We had a wonderful meeting led by Johanna and Teni. 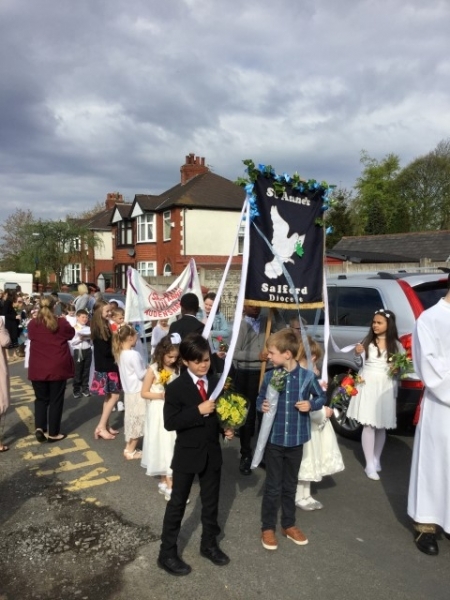 Yesterday we held our May Day Procession! All techie dream wore their finest clothes and brought beautiful flowers with them. 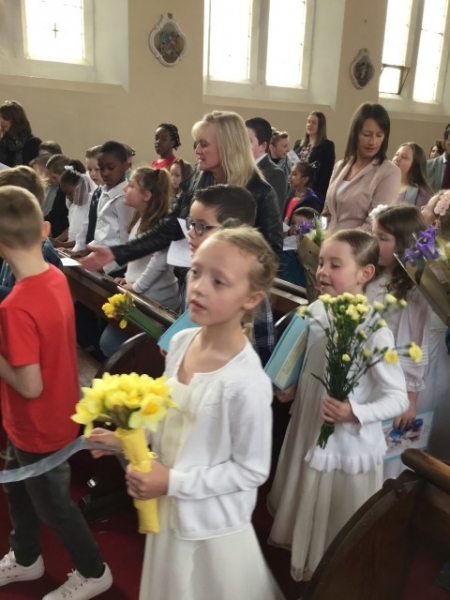 We then walked to Church holding our banners and flowers ready to crown Our Lady. 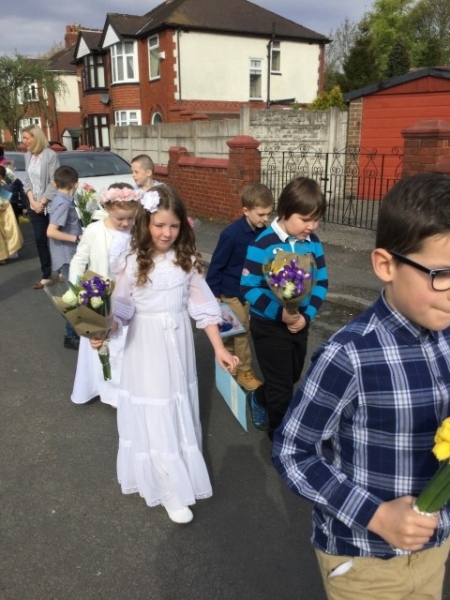 You can see our May Queen and the cushion bearer in the pictures! 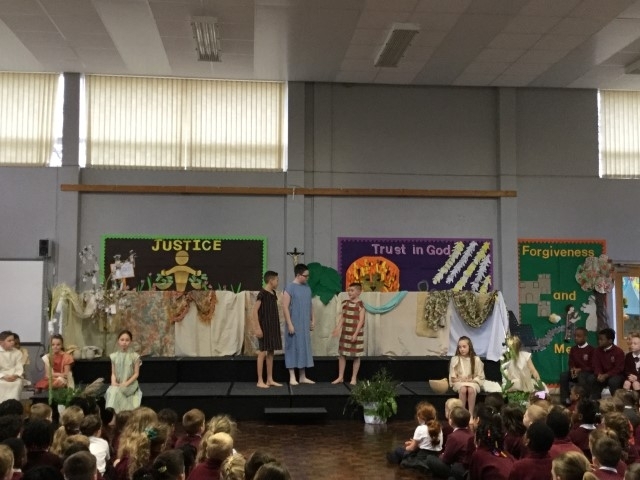 Year 3 told the story of The Garden of Gethesame through drama and dance. It was a beautiful reflection upon how Jesus and his disciples felt before Jesus was arrested in the Mount of Olives. 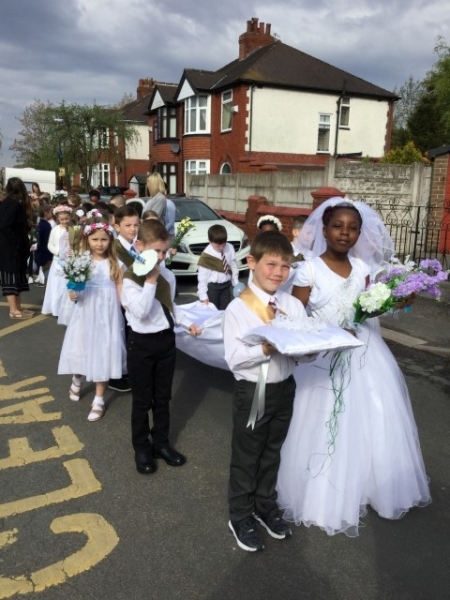 Year 3 beautifully led the procession to St. Anne's church this morning along Ashton Old Road to mark the first day of the month of Mary. 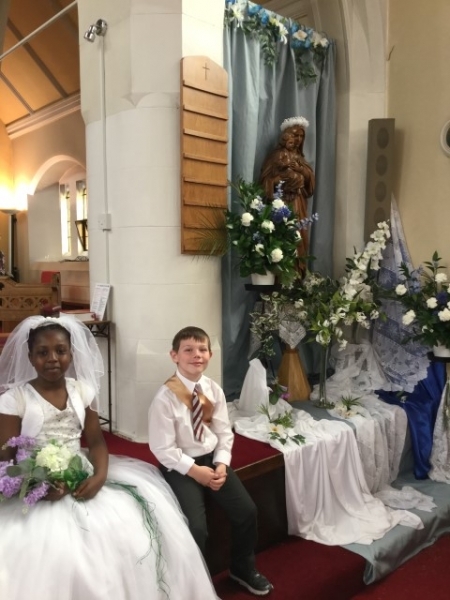 The children led mass and crowned Our Lady's Statue. 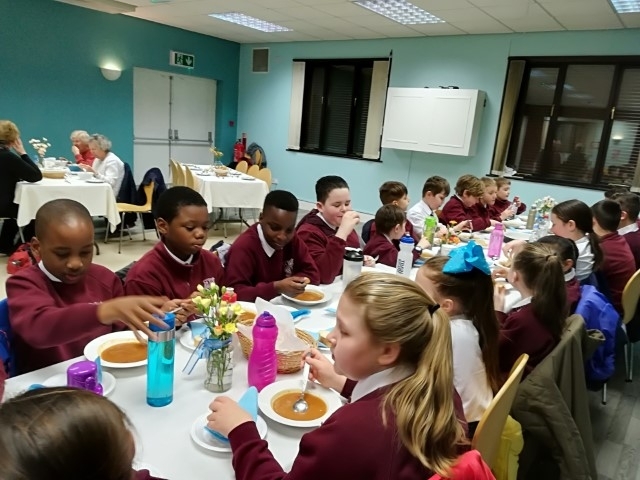 Year 6 had a wonderful time at the Parish Lenten Lunch. 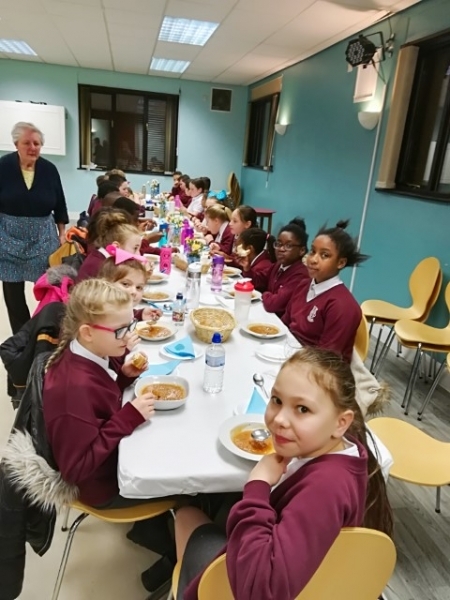 Thank you to all the parishioners for inviting us and making such lovely soup! 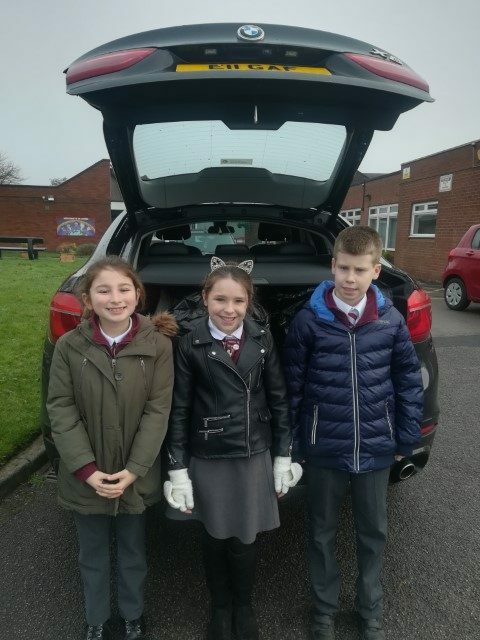 We took clothing, toiletries and reusable cups to Cornerstone to help the homeless in Manchester. 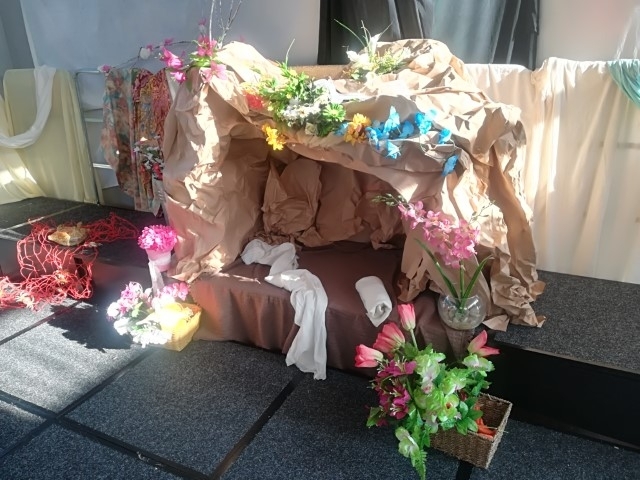 Our hall is looking beautiful to celebrate The Resurrection. 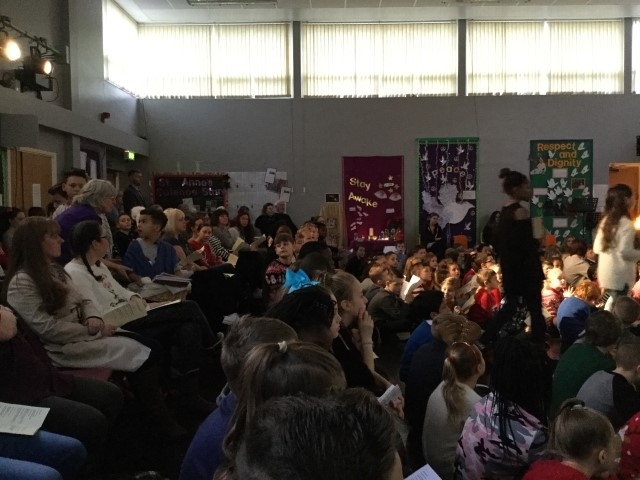 Year four continued St Anne's Lenten assemblies, by reflecting on the moments leading up to Jesus' Crucifixion. They performed it in such a way that it most definitely touched the heart of all those who watched. Reception Thank You Letters to Year 3! 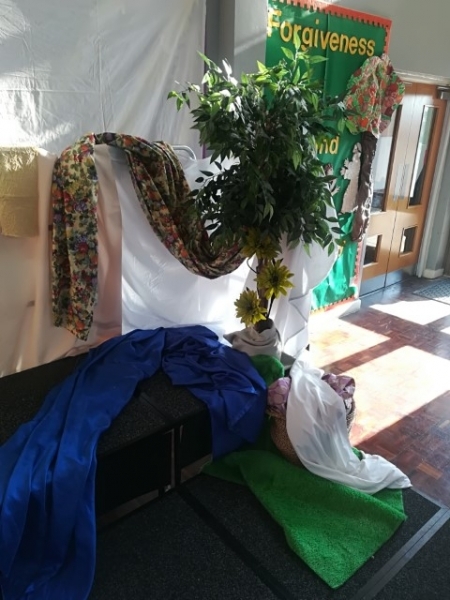 The Reception children loved watching Year 3's Garden of Gethsemane Liturgy and decided to make pictures and write thank you letters to show their appreciation to the children for their hard work! 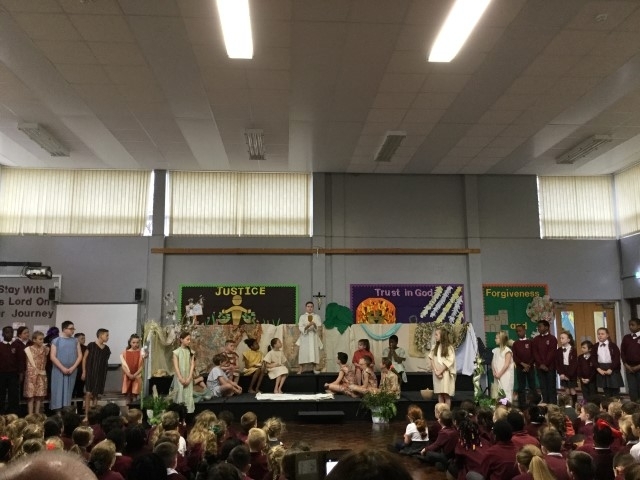 Year 6 started off our Holy Week assemblies with The Last Supper. It was a beautiful reflection of the last meal Jesus would share with his disciples. 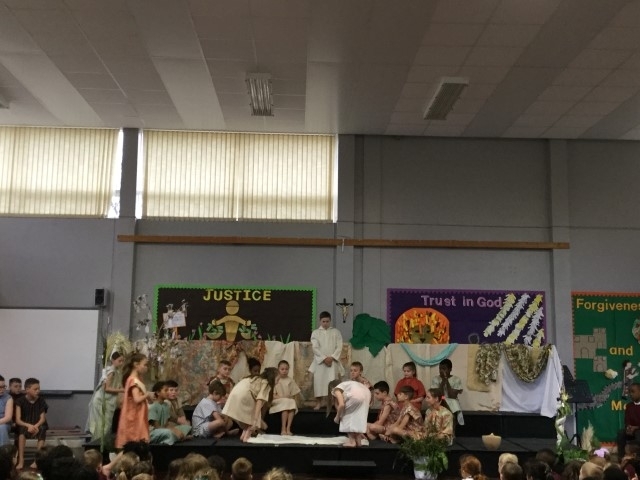 They discussed the significance of Jesus washing the disciples' feet and look forward to Year 3 continuing the Holy Week story today with the Garden of Gethsemene. 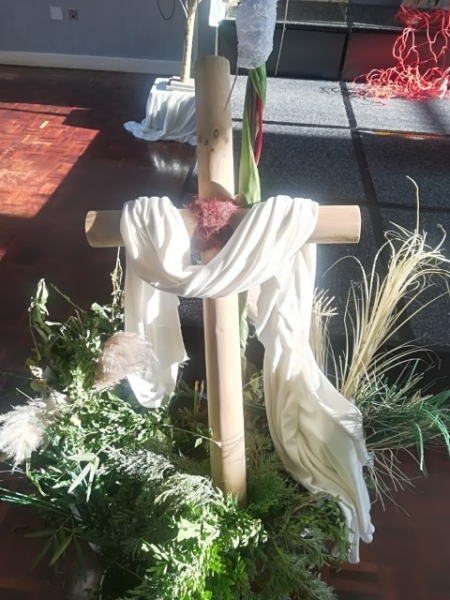 This morning Key Stage 1 led the school and our parents in a wonderful celebration for Palm Sunday. 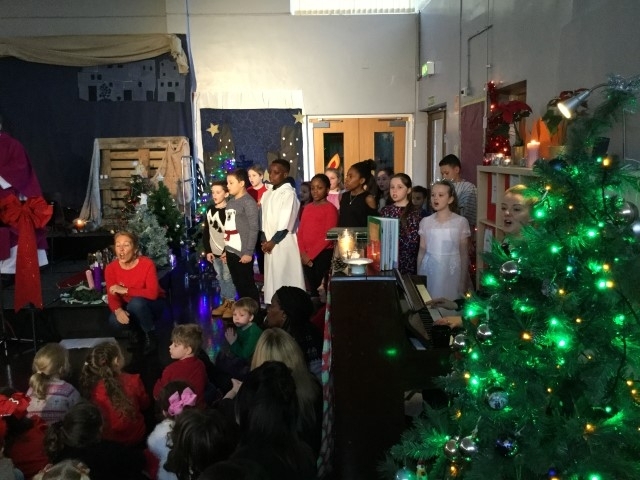 We sang, acted and said our words beautifully. 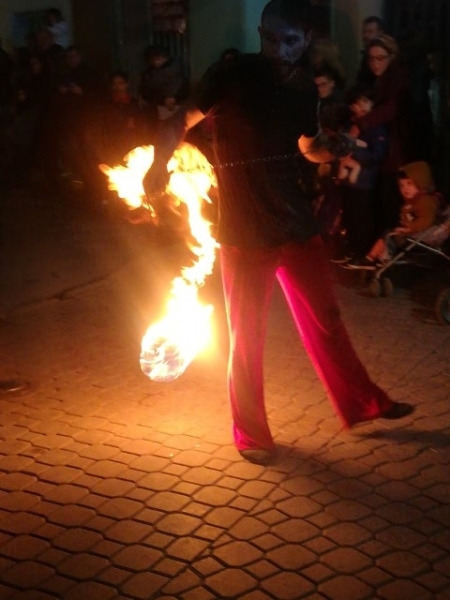 The audience thought it was "very emotional and touching". 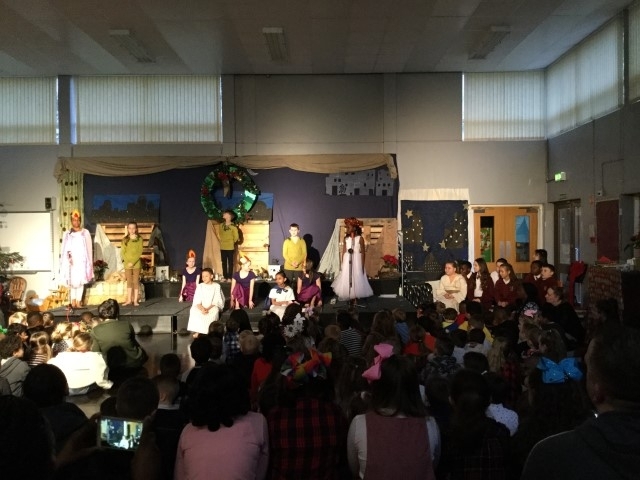 Well done to everybody involved. 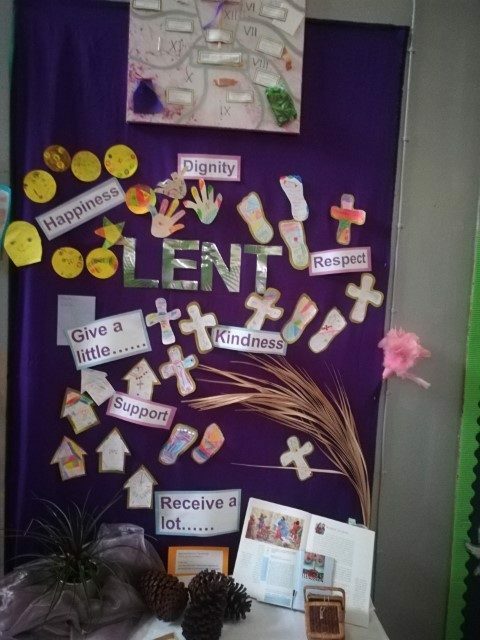 We look forward to the Key Stage 2 assemblies next week during Holy Week. 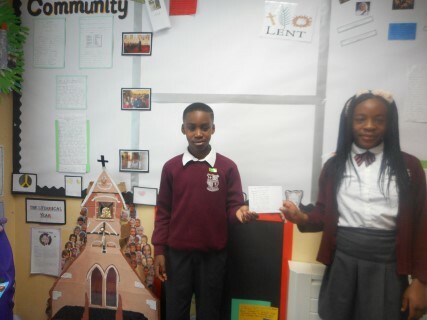 After having the pleasure of Mrs Sivills, Year Four were left with an important task of responding to Pope Francis' letter. All children thrived in writing their response in a postcard form. They each made a reflection on his letter and made a promise of the change they will make starting from today. 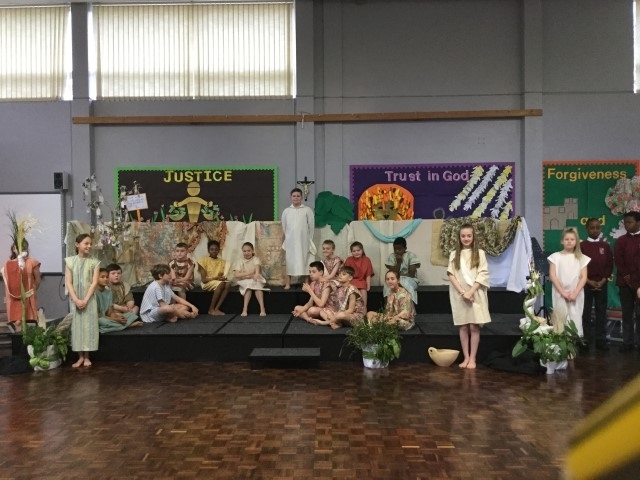 Today we had the pleasure of Mrs Sivills coming in to each class, from Year 1 to Year6, from CAFOD. 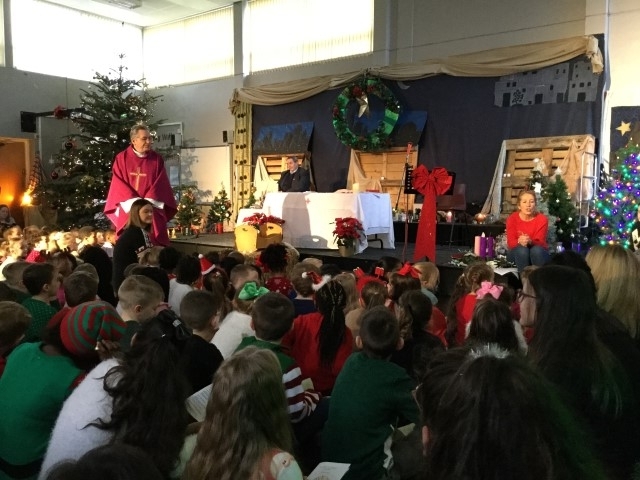 She spoke to all the children about 'Laudato Si', a letter written by Pope Francis. In the letter Pope Francis is urging us to protect our common home: the earth. At the moment our earth is being very badly mistreated and it is developing at a rate we cannot keep up with. We must act know to show our love for God's wonderful creation and out of love for each other. What are you doing to help protect our common home? 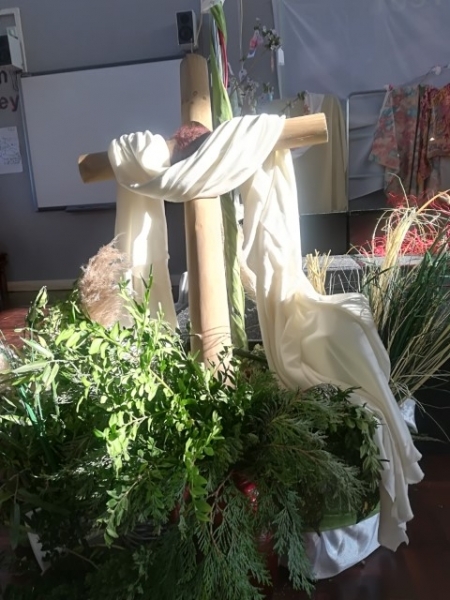 Year 2 were very privileged to have a visitor from CAFOD visit us in class today. We listened carefully to the message of Laudato Si' by Pope Francis and thought about what we can do to look after our common home. 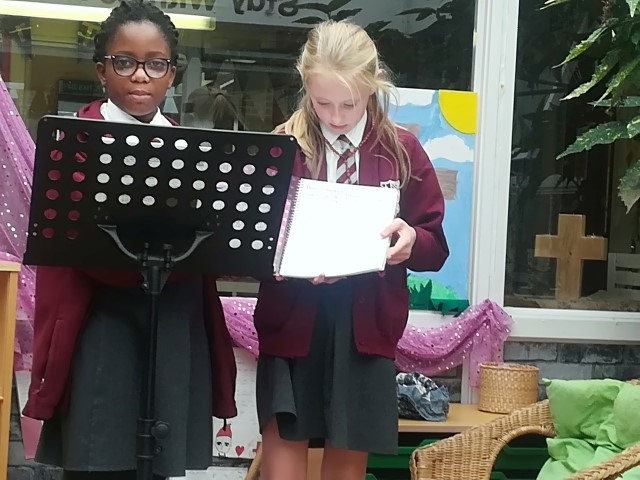 Some of the children in Year Five have wrote letters for the whole school asking for donations of cups with lids for the homeless community. As a result of their hard work we are beginning to receive donations already. A big thank you to all for your continued support for such a special cause. 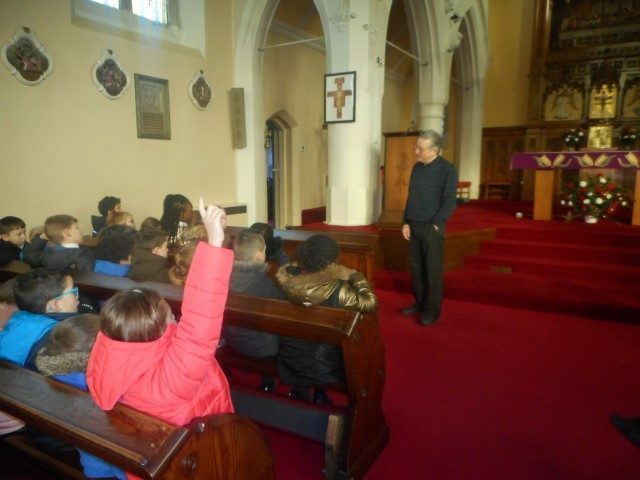 Year 4 would like to say a big thank you to Father Chris who opened up his Church doors for both Year one and four today. He gave an amazing talk about what it means to be part of a community. 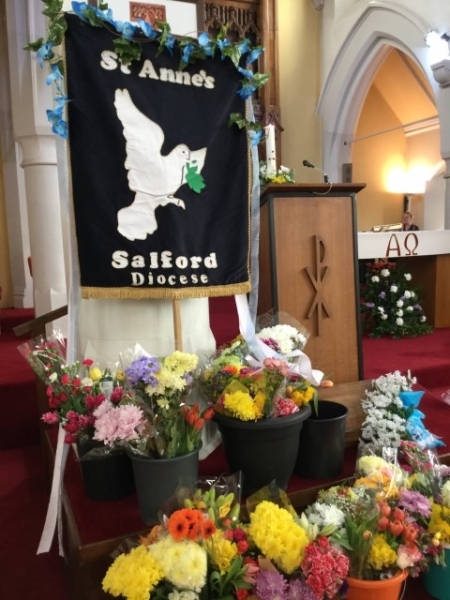 He also gave an interesting speech on the special people who are involved in the day to day running of our parish. 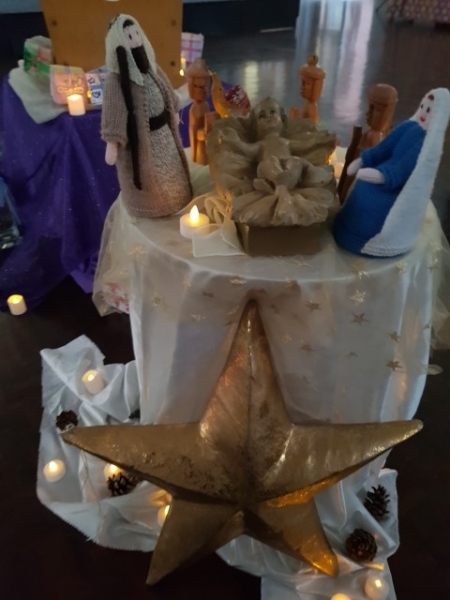 Friday 12th January 2018 - Key Stage 1 Liturgy - "Following the Star"
Today we celebrated The Epiphany of the Lord in our Liturgy. 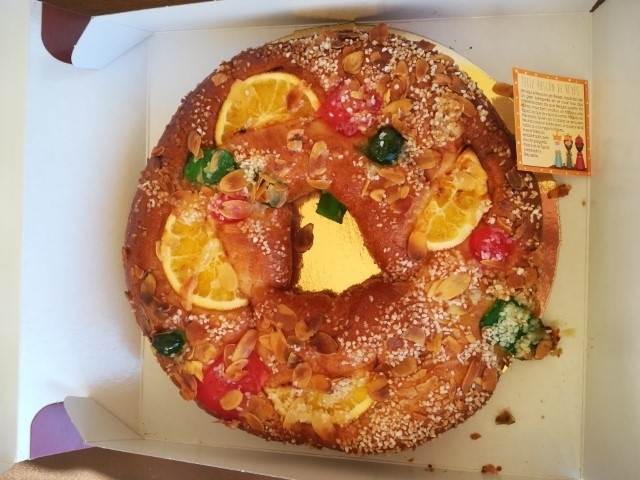 We celebrated the Epiphany of the Lord in Spanish Club by sharing a Roscon and learning all about the traditions in Spain. 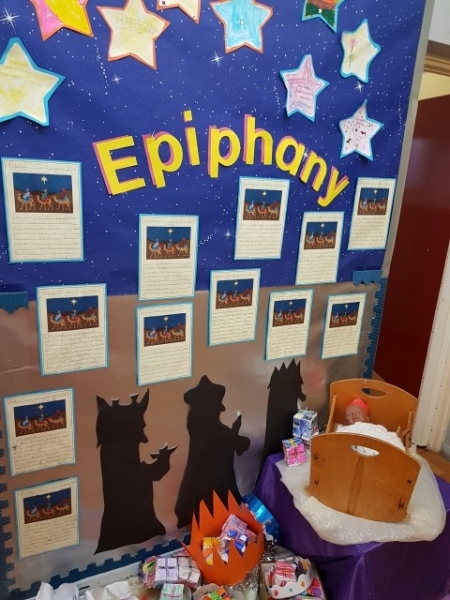 We worked very hard to write an information text about The Epiphany. We had so much fun wearing our crowns as we wrote! 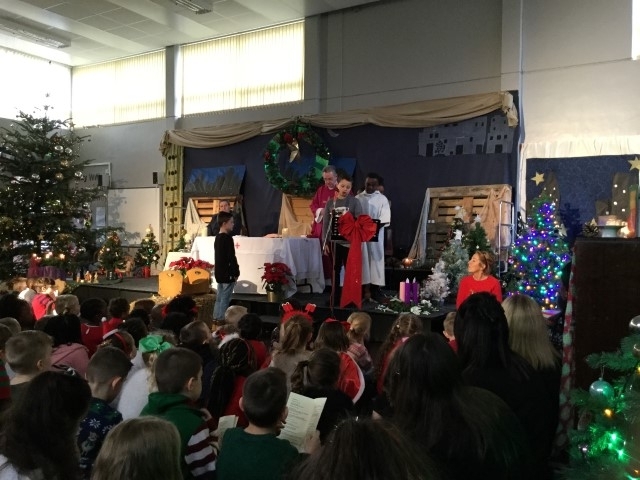 To celebrate the Epiphany we invited parents to join us for our Foundation Stage Liturgy. 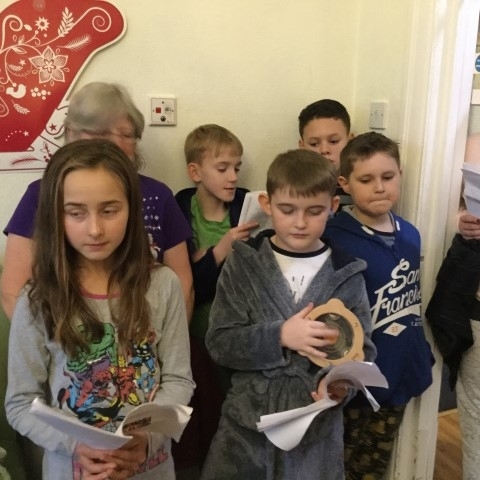 We prayed and sang together and listened to the story of the fourth King who took many years to reach Jesus because he stopped to help lots of people on his journey. 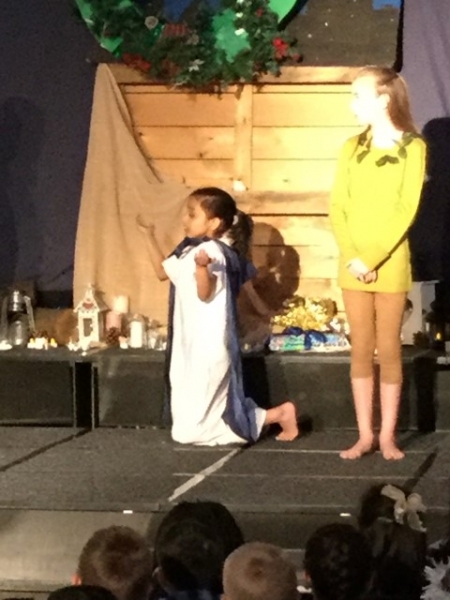 Some of our children helped us to tell the story by acting out the key parts beautifully. 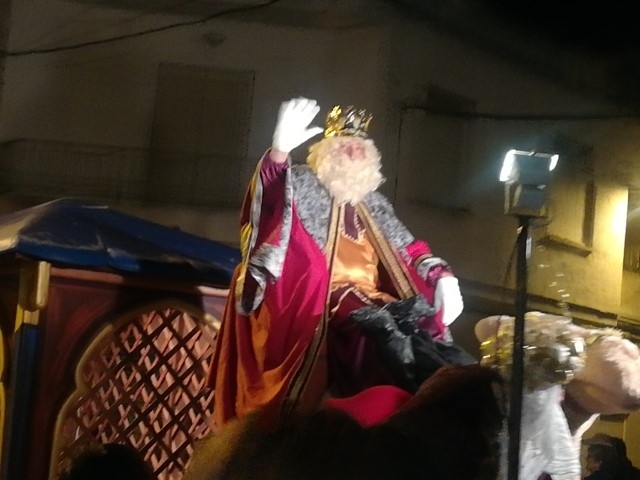 We discussed the special gift the fourth King had given was the gift of help. 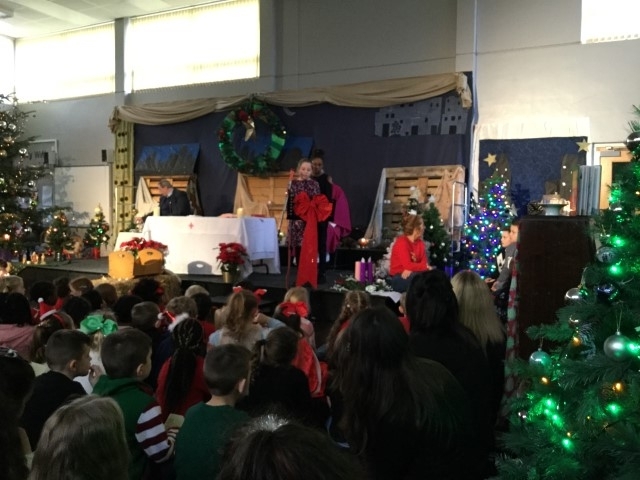 The children thought about how they can give gifts from the heart to show their love for Jesus. 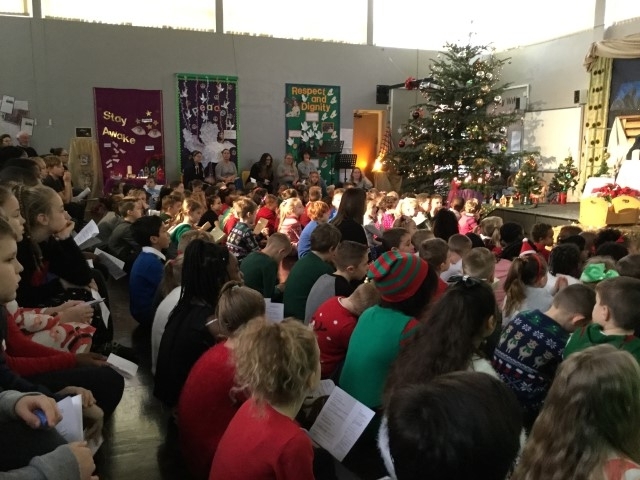 Thank you to all of the children for listening so carefully and to our parents for joining us in this special celebration. 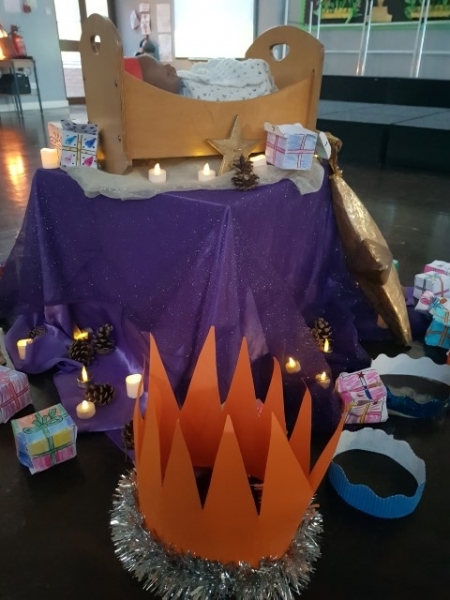 We have loved learning about the 3 Kings and their journey to Bethlehem to see the new born King. 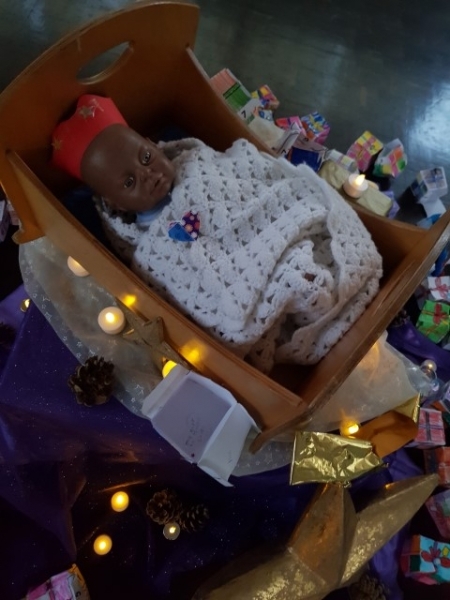 To celebrate the Epiphany we made stars and crowns and wrote about the King's Journey to see Jesus. 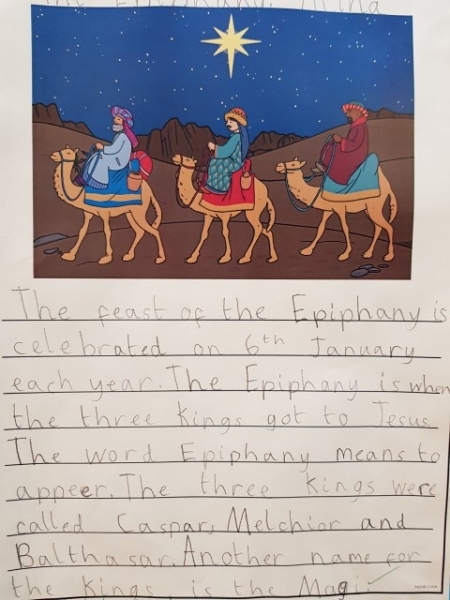 We are so excited to celebrate the Epiphany this week in school. 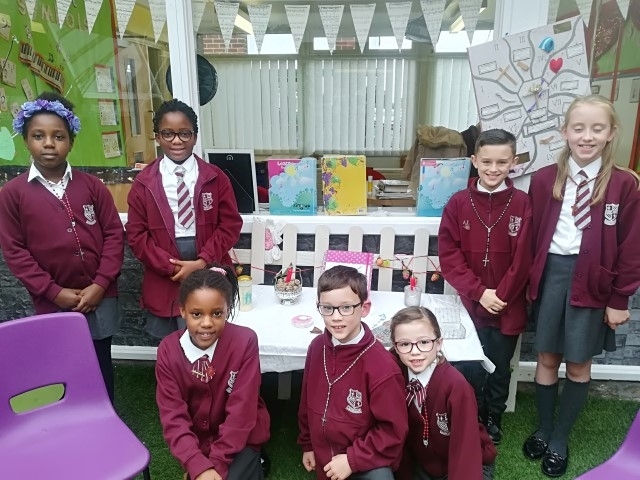 We made crowns in the Creative Area and in the D&T Area we used 3D cube nets to make a gift box. We had to think hard about how we would stick the net together and how we would make a lid that opens and closes. 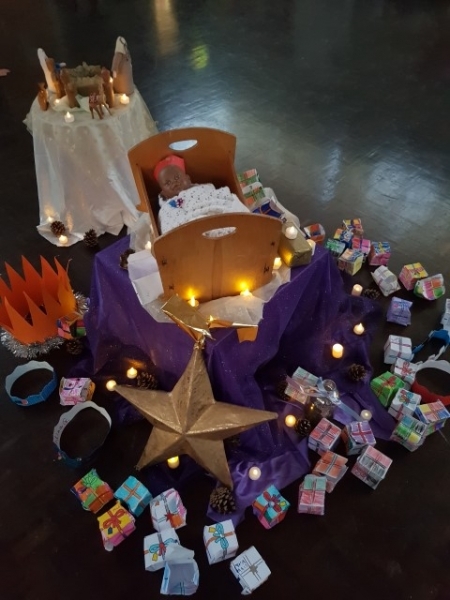 We thought about what gift we would bring the baby Jesus and wrote that on the little heart which we then put inside our gift box. In the Construction Area, we made kings, camels and gifts. 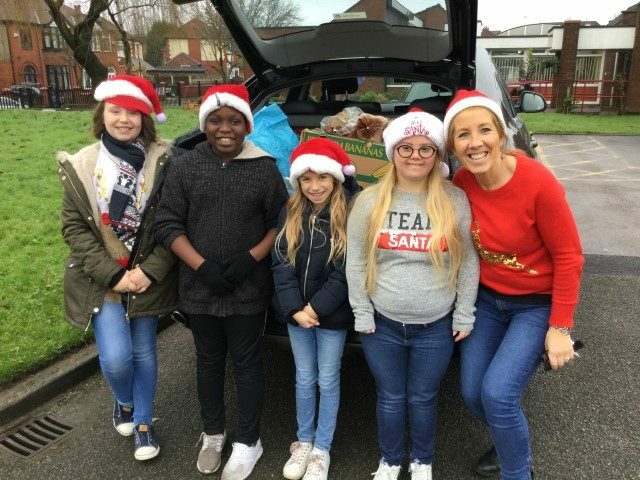 Mrs Gaffney is on her way with a few members of the GIFT Chaplaincy to Cornerstone to donate non perishable food to help the homeless this Christmas. 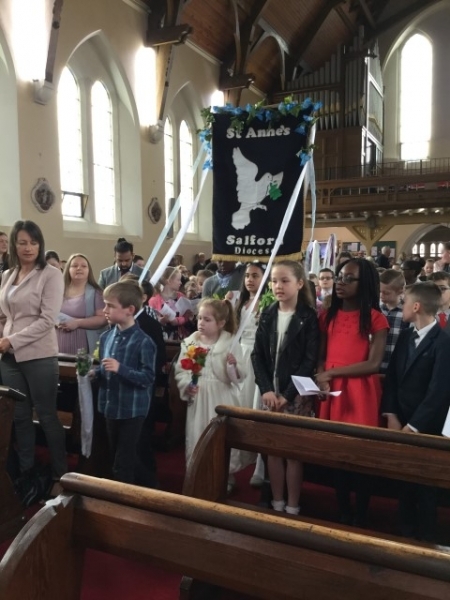 Thank you children and parents for all your very kind contributions. 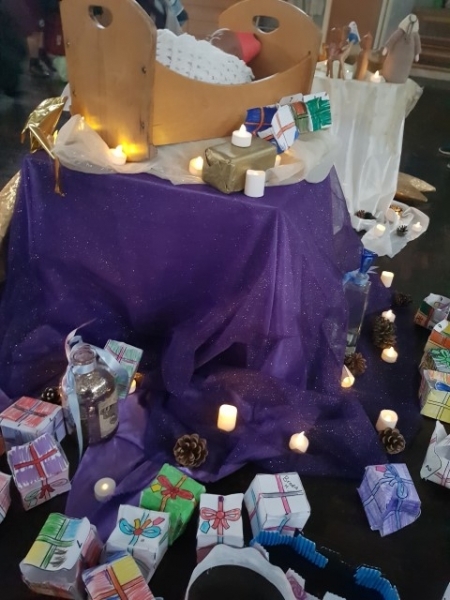 This morning we celebrated our Advent Mass in school. The GIFT Chaplains chose somebody they wanted to work with to help the, plan the Mass. 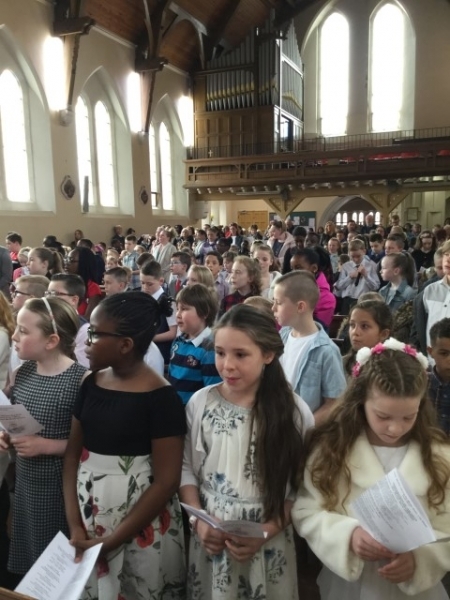 They did a super job and Mass was beautiful. Fr Chris came to celebrate Mass with us. Thank you to everybody who was involved with planning it. 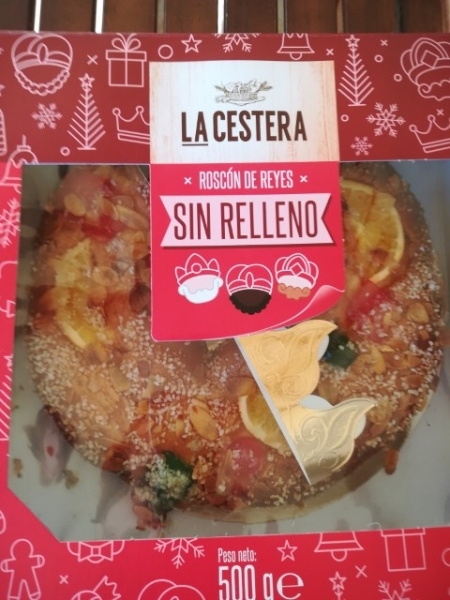 We wish you and your families a very Happy Christmas and a Happy New Year! The hall looked beautiful this morning! 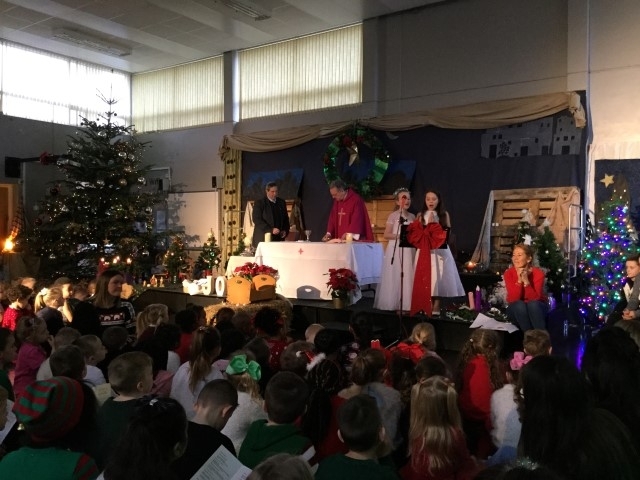 Thank you to our wonderful GIFT Chaplains who planned the Mass themselves and delivered it themselves. You did a wonderful job! 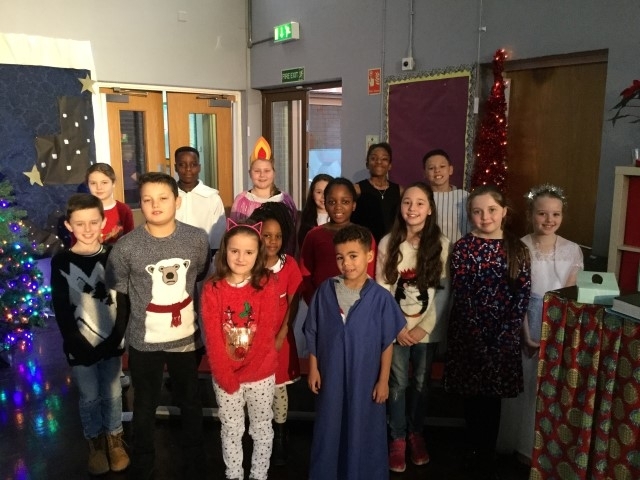 Year 6 performed their Advent assembly. It was beautiful! 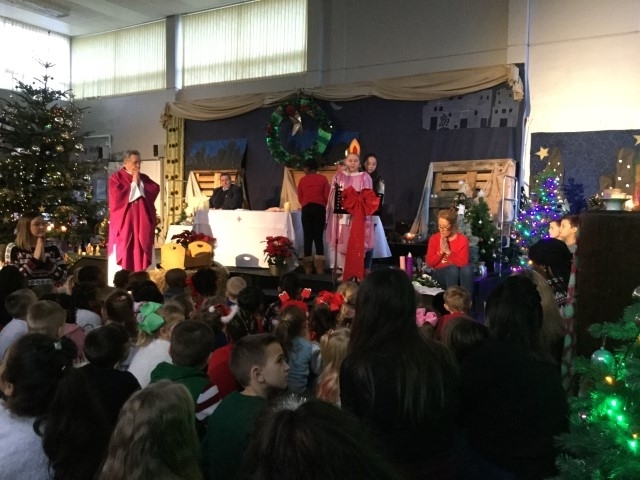 We saw what a special lady Mary was and watched her obedience and faith as she received an unexpected visit from the Angel Gabriel. We also saw her shock as she discovered her cousin Elizabeth was pregnant also. 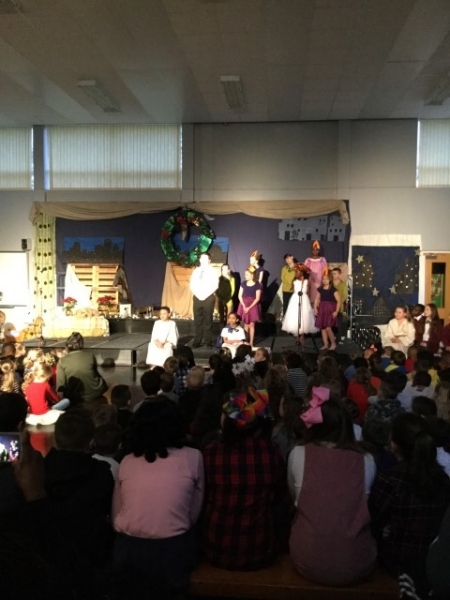 Thank you to the children for doing such a wonderful job. 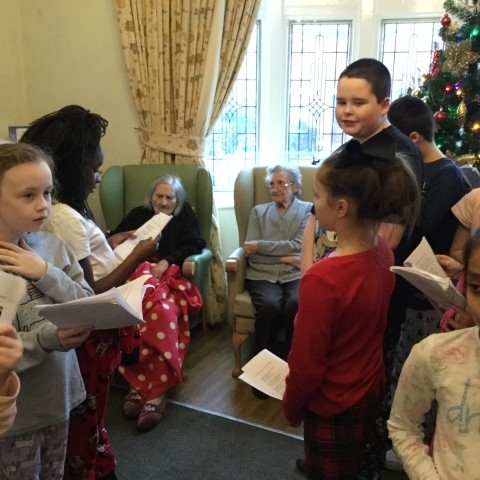 Year 6 went to sing Christmas carols at Auden House, a local care home. 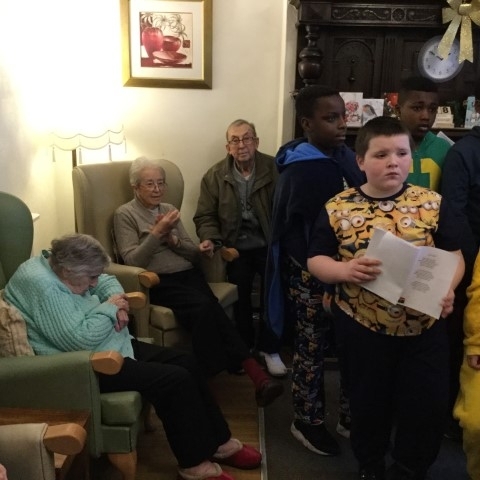 We had a wonderful time celebrating with the residents and were so happy they joined in with us! 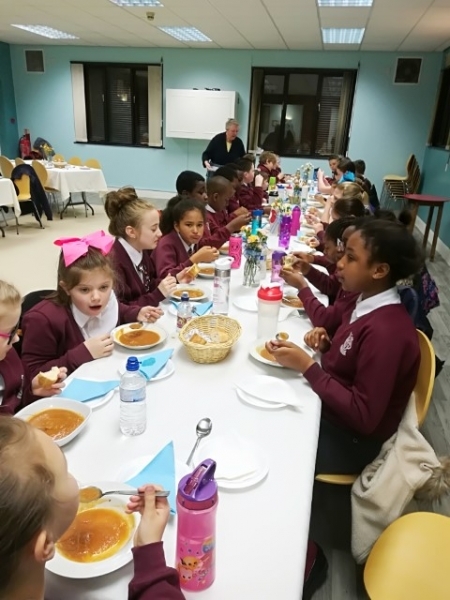 The pupils of St Anne's came together and shared a table to celebrate during the season of Advent. The teachers served us our festive lunch of turkey and we all had a great time! 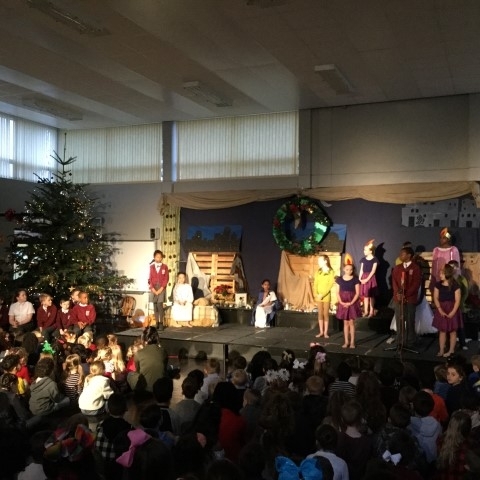 Key Stage One put on a beautiful Nativity. Thank you to everybody who was involved! 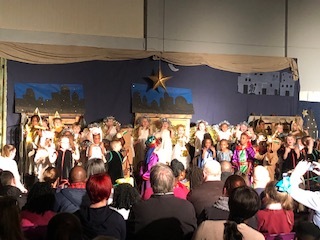 Foundation Stage put on a wonderful performance of Whoops-a-Daisy Angel. 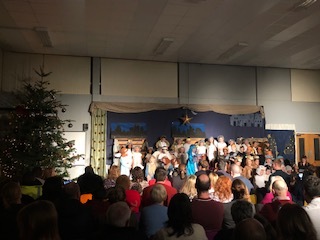 Thank you to everybody involved-you were all wonderful! 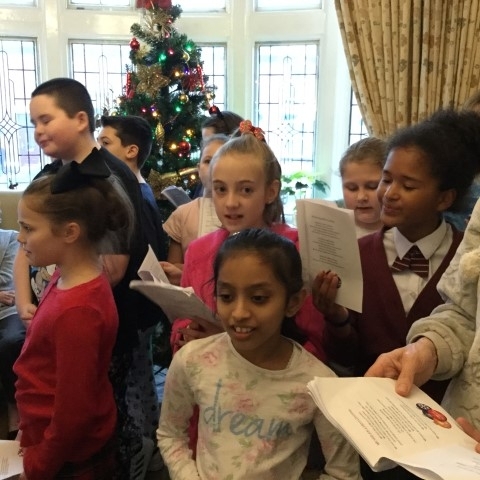 Last week St Anne's held their annual 'Christmas Markets' fundraiser where we raise money for the Good Life Orphanage and Tameside Trauma Unit. Children from every year group made crafts and baked goods to be sold at the Markets-it was a wonderful success! 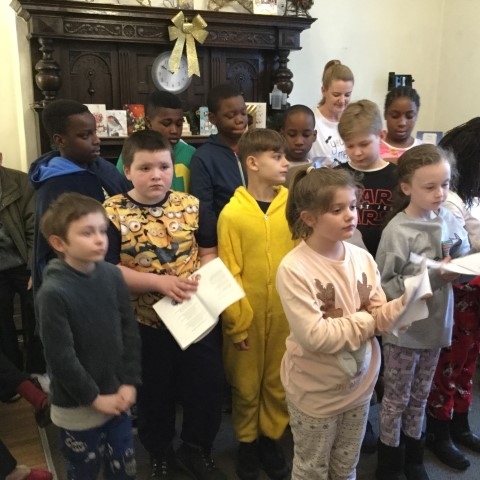 So far, we've raised over £650! Thank you to everybody who supported the event. Year Six made and designed votive candle holders, made from clay, to sell at the Christmas Markets this year. They also made chocolate covered marshmallow kebabs, which sold out very quickly! 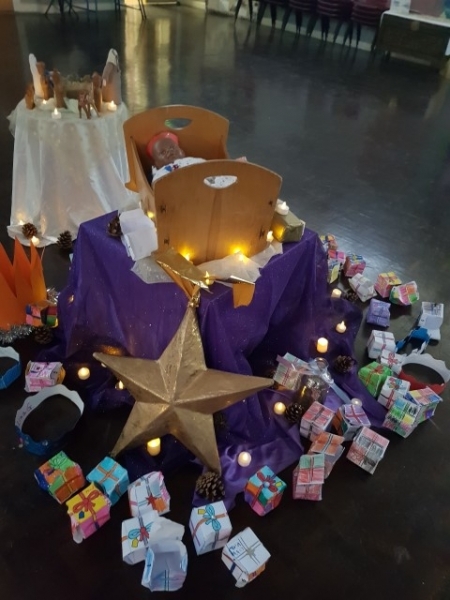 Please take a moment to look at our photographs of school during the season of Advent. 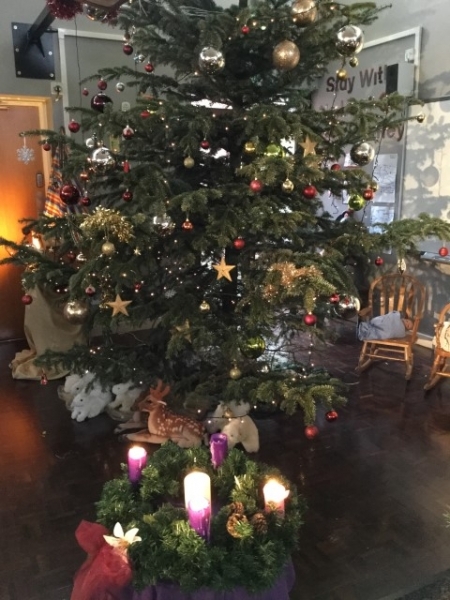 The nativity scene is all set in the front entrance of school, our Christmas tree is up in the hall and the theme of love is evident from the quad area. 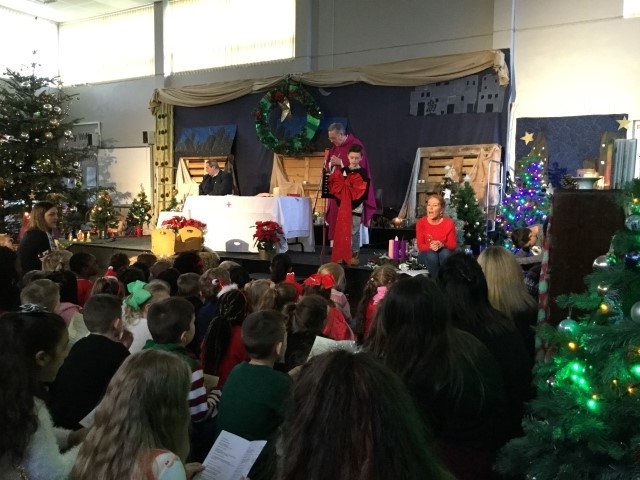 Year 3 led us in a beautiful assembly to mark the First Week of Advent. 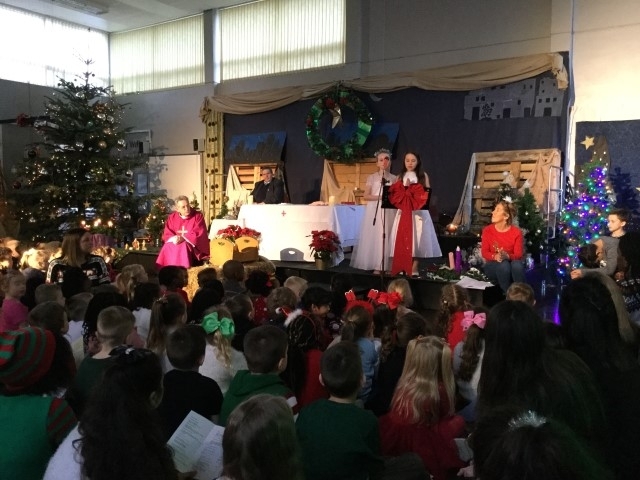 Last week Year 4 led us in a beautiful assembly to mark the Second week of Advent. They reminded us that as we prepare our homes for Christmas, we must not forget about preparing our hearts and minds also. 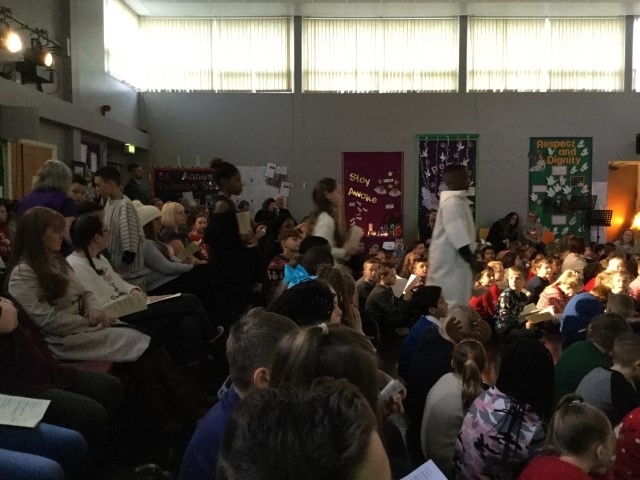 This morning Year 5 led us in a celebratory assembly as it is Gaudete Sunday this week-the Third week of Advent. They reminded us that we must look for examples of Jesus within others and ask ourselves if Jesus can be seen in us.